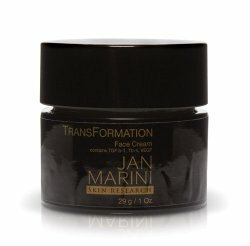 Jan Marini Transformation Cream - Is it possible to transform your skin? I really am the most hesitant/skeptical person when it comes to gimmicks that claim to work magic. ha But, I am living proof that a cream, cleanser, peel, etc...can transform your skin. The environment we live in takes so much out of our skin. If it is not replenished, we will soon see the effects of neglected skin. So, believe that a really great jar of cream CAN transform. Jan Marini Transformation Cream is fortified with a bunch of yummys. It contains hyaluronic acid, vitamin E, and citric acid. These key ingredients help with the skin natural moisture levels, protect the skin, and brighten dull skin. All things we can use more of. Great for those with dry and aging skin. AFter cleansing and toning, apply Jan Marini Transformation Cream over entire face at night. "So far, I am so impressed with Jan Marini products." "Too much for my already oily skin. Worked wonders for my mom who has dry skin." "Does not leave my skin feeling oily, just moisturized." "I love this product, it smells lovely and has not broken my skin out." "I personally did not see a difference in my skin." "The cream is light and does not clog my pores."